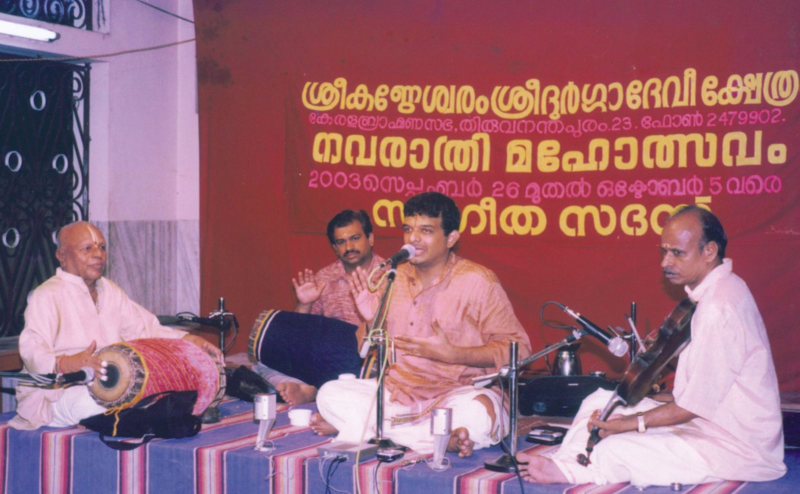 TM Krishna and other musicians play a concert for the public in southern India. Keeley McMurray is a junior double majoring in English and Religious Studies with a minor in Theatre. The following post was written for Dr. Ramey’s REL 321 course, Religion & Identity in South Asia. Visual and performing arts continue to be seen as bold expressions of personal identity in modern cultures throughout the world. Despite the fundamental inclusivity of art as means of sharing and preserving culture, the politics of artistic expression have limited the opportunity for certain groups to practice and perfect their crafts. In South Asia, art is complicated by the complex religious and social identities of those living in the region. Elite Hindus often restrict India’s cultural legacy to artistic forms that they dominate, overshadowing a myriad of minority contributions and subaltern narratives. A primary example is Carnatic music, a religiously-inspired genre significant to Hindu culture. For centuries, upper castes have preserved this music as a divine art form symbolic of brahman and practiced it with utmost artistry. Because of its association with divinity, purity, and pleasure, upper castes have often limited the practice and enjoyment of traditional Carnatic music to major temples, royal courts, and a few rich landowners; local kings, some being composers or musicians themselves, would traditionally patronize performances. In recent years, however, the exclusivity of cultural and religious identity associated with Carnatic music is changing to accommodate a more diversely artistic society. Activists are making an effort to ensure that those left out of the cultural narrative are given their recognition, and have a fair opportunity to explore their artistic potential. Thodur Madabusi Krishna, a classical musician in southern India, has made it his mission to break the social barriers surrounding Carnatic music in order to “liberate the art to new spaces.” While he has encountered opposition from those that wish to preserve the restrictions on this genre of music, Krishna was recently bestowed the Ramon Magsaysay Award for emergent leadership in “ensuring social inclusiveness in culture.” Characteristic to southern India and largely untouched by Persian and Islamic influence, elements of Carnatic music trace their divine origin to the Vedas. Thousands of hymns are dedicated to the gods and chanted in Hindu ritual, put to complex melodies called Ragas. These proponents assert that the potency of this music demands ritual tutoring through the gurukula system, in which a student would live and learn with a Carnatic guru. Gurus often descended from ancient lines of musicians and composers, and thus were selective and rigorous with instruction. With these qualifications to become a worthy and revered musician, many were left unable to pursue their art. The way society has restricted Hindu culture further divides those who identify as Hindu. In a region as complex as India, it is problematic to homogenize artistic expression in reflection of the elite few. In hopes of promoting a more unified culture, Krishna is taking action to transform the arts into a more egalitarian space. He began by hosting concerts in unconventional locations: crowded buses, railway platforms, and even the slums of Sri Lanka. In areas that would have remained unexposed to classical music, Krishna has introduced school curriculums for Carnatic instruction, musical scholarships for rural youth, and free music festivals for the general public. Most importantly, his Svanubhava movement brings together musicians of diverse social backgrounds in an attempt to “heal differences and break stereotypes.” By dismantling the social structure of Hindu culture, one achieves a more reformed portrayal of India: a diverse nation where art is appreciated, regardless of social identity. This entry was posted in Relevance of Humanities, Religion in Culture, Student Blog and tagged Asia, Keeley McMurray, REL 321, Steven Ramey by admin. Bookmark the permalink.